As you may already know I got a kitty. Here she is (being held by my partner)! 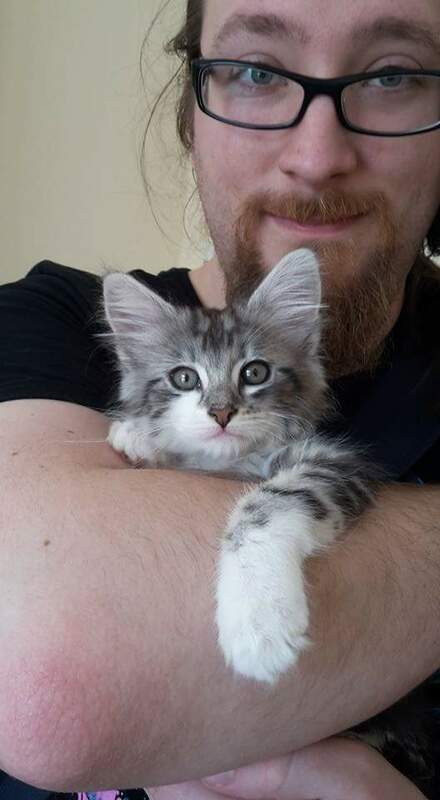 Her name is Max, and we picked her up on Thursday 5th May. 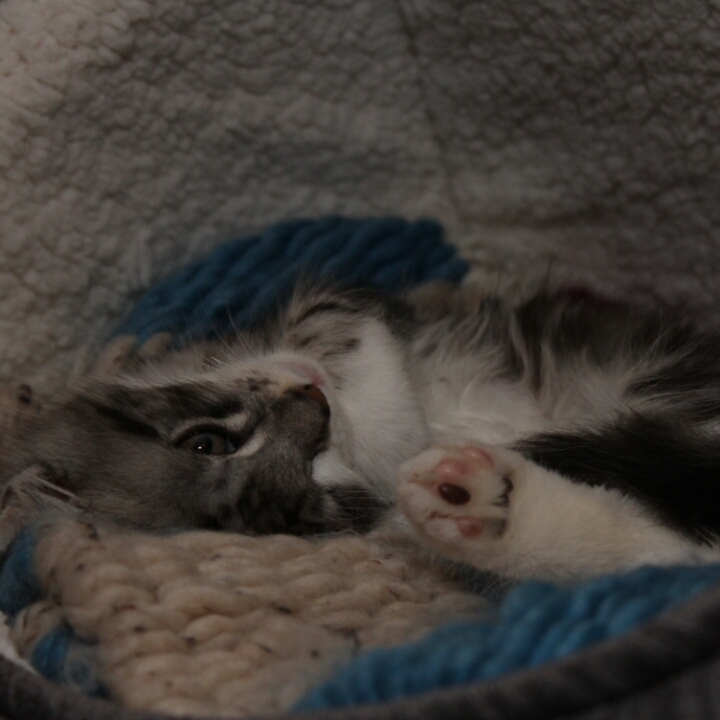 She is half Norwegian Forrest Cat and half Domestic Shorthair. I weaved it using a 12 peg loom, using 6 and a half balls of Sirdar Big Softie and about 25g of bog standard acrylic dk in cream to thread the pegs. The Eagle eyed amongst you may notice that the creams do not match. This is because I started the project using one colourway (fleckie), but when I went to the shop to get more there was none and I didn’t have time to order online so I had to buy a slightly different shade (nubbly). I am not that worried though. I am sure the kitten really doesn’t care about a slight variation In shades. 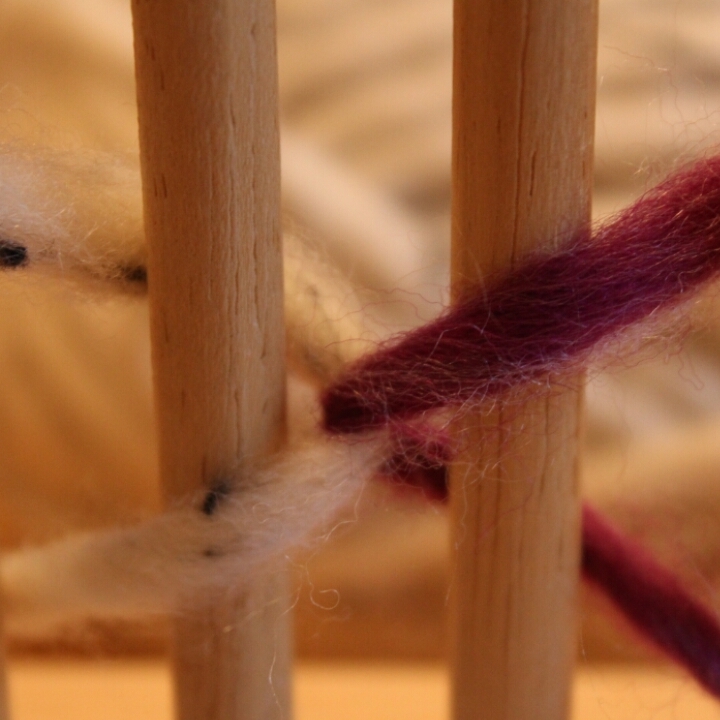 Anyways, to begin you should thread your pegs with standard acrylic DK and tie each set of three pegs together so you have 4 knots at the bottom of your work. 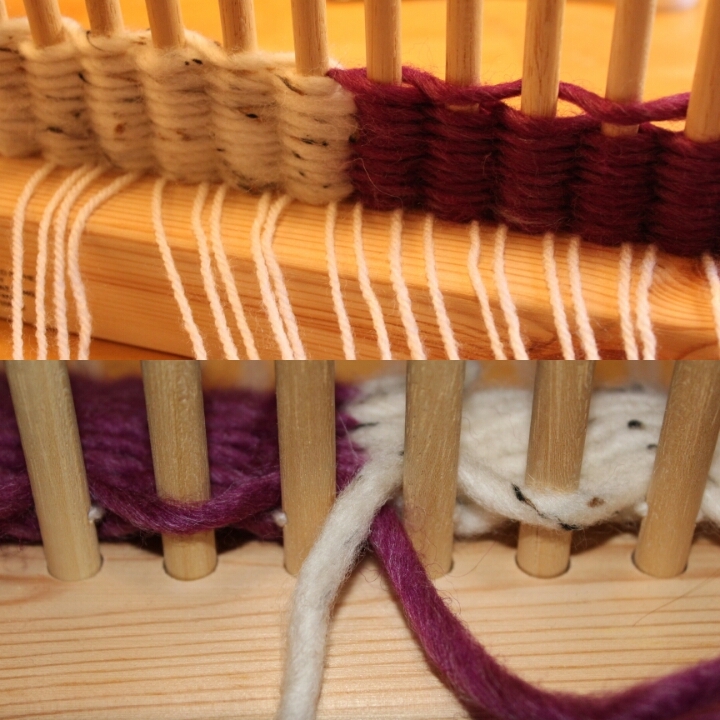 Then use a slip knot to attatch two different coloured yarns to the pegs, one on either end. Weave them both towards the center of the peg loom, in a sort of mirror image of each other, until they meet in the center between the 6th and 7th peg. 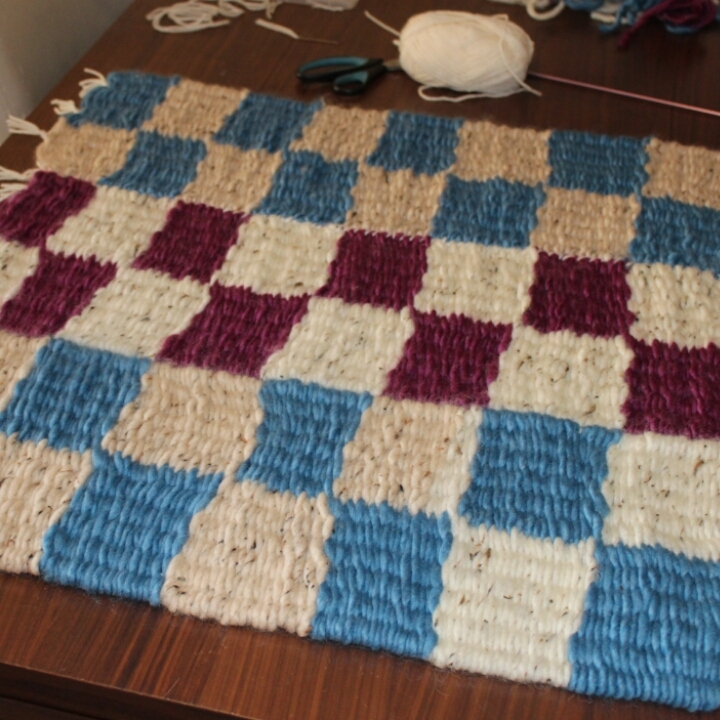 Then bring one yarn under then over the other. Turn round and go back the other way. When you get to the beginning make sure to catch the end up the side of the work. This way you won’t have to sew it in afterwards. Keep repeating this until you have done it 20 times. The push it off of the pegs. Begin as you did before, but when you reach the center, just pass one under the other and continue in a straight line.then repeat the 20 rows. Continue this until you have reached the desired length. We you have reached the end, push your work as far down the threads as you can, to give your self adequate space to tie your finishing knots. Then cut the threads from the pegs and gather them into 3’s like at the beginning, tying them into knots. Now all you need to do is space the work out evenly. 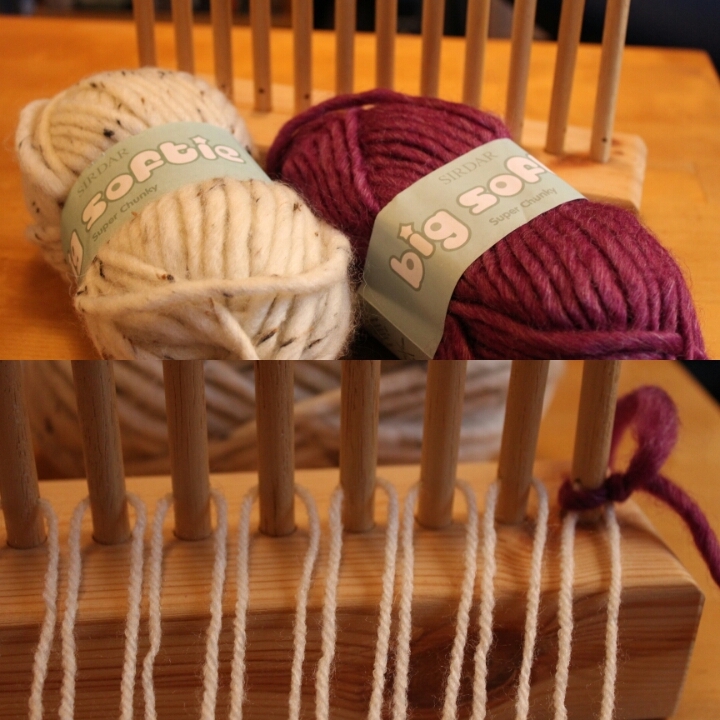 Now I only have a 12 peg loom so to acheive the desired width, I had to make three sections and sew them together. If you had a wider loom this wouldn’t be necessary. 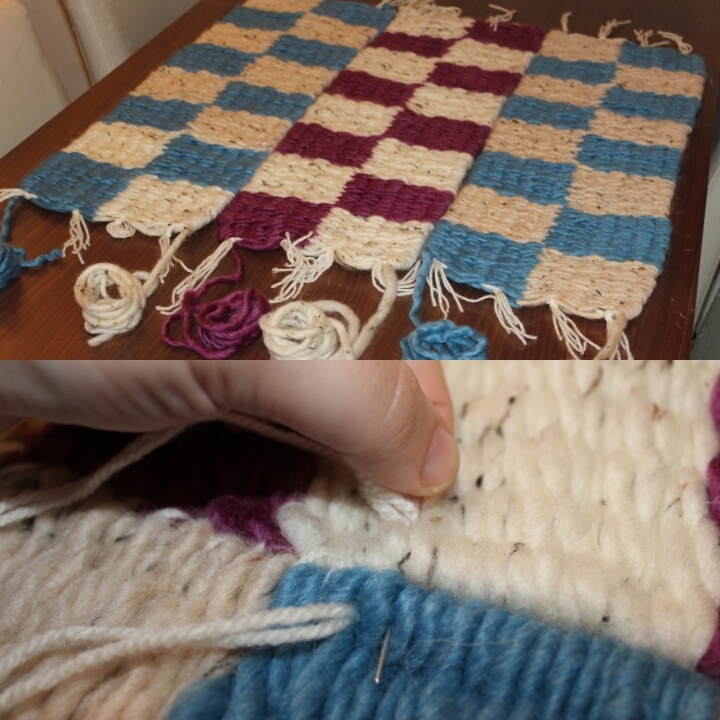 If you do need to sew multiple parts together just make sure you catch the threads running through your work. And that’s it. I am new to weaving so this is the best summary I can give. If you have any pointers on technical terms or anything else, or need anything clarifying, please get in touch! Just a quick one today! 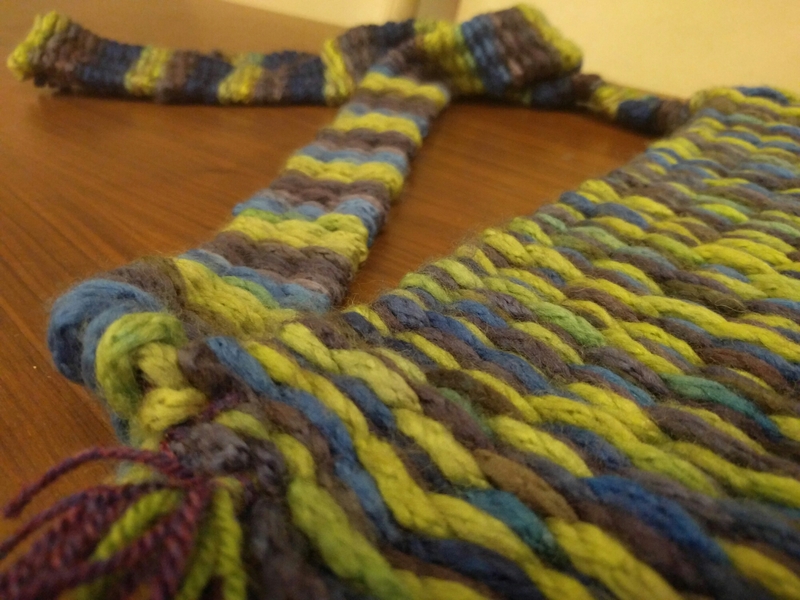 Popping in to share with you my first ever attempt at Weaving. 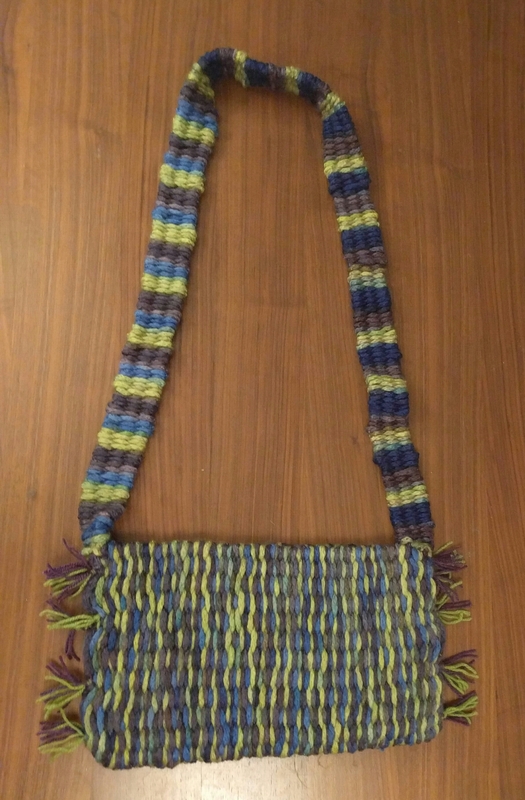 I made this cute little shoulder bag. What do you think? The yarn is Arucania Maipo. I bought it at the Spring Knitting and Stitching show earlier this year. I weaved it using a 12 peg peg loom. What do you think. I love it. It has its flaws but for a first attempt I think it is pretty cool.